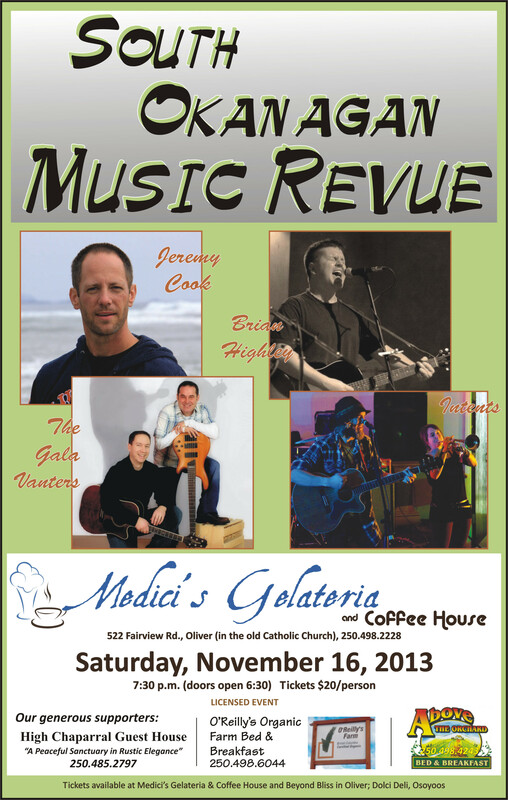 Medici’s is back on November 16th with a great fall concert that highlights some of the finest musicians that you can find in the valley. Four great acts in one great night. From the Press to the pulpit! From the Winery to the brewery! Marie-Eve & Sid Ruhland (The Intents), the steel string acoustic guitar work of Jeremy Cook, the versatile and highly talented cover-man, Brian Highley and that very hard working valley band,The Gala Vanters. You’ll get some folk sounds, great vocal renditions, beautiful guitar work and The Intents cover everything else from French Canadian folk, 90’s punk rock, classic folk rock to ska and reggae.